Education on nutriton coaching and diet strategies often centres around improving body composition and quantifying intake, and rightly so. However, this is only one lens through which to view how we eat impacts our health and performance. There are vast areas of nutritional science research that can (and should) be incorporated into nutrition/dietetic practice in order to allow individuals to be the healthiest humans they can be. In this seminar we will examine many areas of nutrtion research and practice that can be used to improve human health. The seminar is aimed at nutritionists, dietitians and fitness professionals who want to upskill their practice through exploring the latest concepts in nutrition science. We’ll be taking a look at some of the hottest topics in nutritional science and practice with a critical mindset, helping you understand what’s valid and what’s not. One of the emerging dietary interventions to gain popularity in both research circles and beyond in recent years is time-restricted feeding (TRF). You’ll learn what the most up-to-date research has to say, the potential uses in practice and examples of such an intervention may be applied. Non-Diet Approaches: Help or Hindrance? Given both the conventional lack of efficacy and potential for negative psychological consequences of weight loss advice & interventions, the area of “non-diet” approaches has offered hope. We’ll take a look at some of the concepts that fall under this area (or closely related), such as intuitive eating, Health At Every Size and preoccupation with food or dieting. The aim is to determine whether some of these ideas are beneficial or counter-productive, with some implications for practice. Sometimes it can feel like many nutrition conversations in the fitness industry are only about macronutrients. And more worryingly, the promotion of the idea we should all be “tracking macros” is pervasive. Here you’ll learn many methods for setting dietary goals, assessing progress and giving recommendations, that are not reliant on macronutrient tracking or suggesting. Practitioners will encounter many people who objectively in poor health based on common biomarkers like fasting glucose, blood lipids and blood pressure. In such cases, a medical professional should be working with the person and overseeing what they do. But what are some safe dietary approaches that are likely beneficial for improving health? Circadian biology is one of the most fundamental underpinnings of health. Here you’ll learn not only how strongly it dictates health, but you’ll learn about how external factors like light exposure, meal timing and social schedules can play a pivotal role. Danny Lennon is the founder of Sigma Nutrition. Danny has a masters degree/MSc. in Nutritional Sciences and a BSc. in Biology & Physics. Danny is the host of the popular Sigma Nutrition Radio podcast, with more 3 million downloads to date. Danny spends most of his time reading nutrition research and talking to researchers about their work. This constant learning in conjunction to his coaching experience sets the stage for his favourite activity: condensing all this information into an engaging and educational format, presented through seminars and lectures. Danny has spoken on a variety of nutriton topics at events around the world, including London, Amsterdam, Vienna, Melbourne, Sydney and of course Dublin. His philosophy is based on the interesection of deep curiousity and acute awareness of what we don’t know, using science as the tool to help better understand ideas. The seminar will take place in the Campus Conference Centre at the National Sports Campus in Blanchardstown. Whilst predomindantly aimed at nutritionists, dietitians, coaches and fitness professionals, the seminar will also prove useful for individuals with a deep interest in learning and with some pre-existing nutrition knowledge. Yes! You will get a be provided with a high-protein lunch. Vegan options available on request. What times will the event run from? The event is expected to run from 10 am to 4 pm, including an hour break for lunch. Will I get access to slides? Yes. 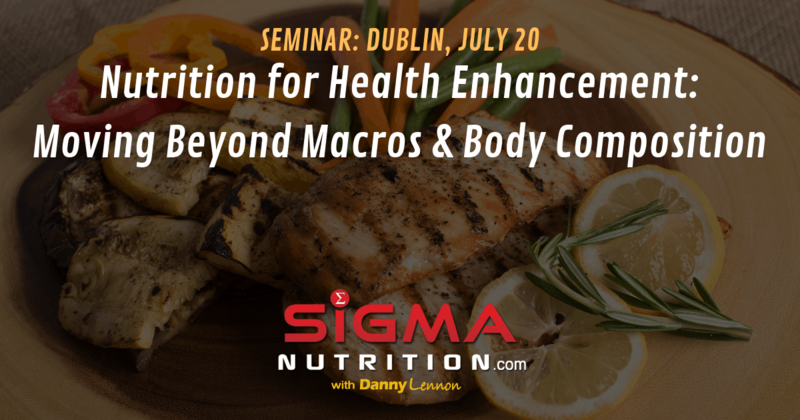 All attendees will receive a copy of all lecture slides, in addition to several other Sigma Nutrition resources. Do I get a certification? A digital certificate of attendance will be emailed out to all attendees in PDF format. Note that this isn’t an accredited certificate from a body like REPS or similar. Is there a discount for a large group booking? Yes, in cases where a group of athletes/coaches from the same club wish to book, there is a discount available for bookings of 5 or more tickets. Email Danny on danny@sigmanutrition.com for details of how to avail of the discount. If you are a 3rd level student then you are entitled to 10% off of your ticket. You can avail of this by using the code STUDENTPASS at checkout. Note that you will be required to show your card on the day of the event to gain entry.